Image credits: Araci et al. Stanford Professor of Bioengineering and Applied Physics, Stephen Quake, and Head of the Ophthalmic Science and Engineering Lab at Bar Ilan University Dr. Yossi Mandell teamed up and created a new device which allows glaucoma patients to continuously monitor pressure levels in their eyes – this provides not only a better monitoring, but it also means that patients don’t have to go to the doctor every week. Glaucoma is a term describing a group of ocular disorders characterized by abnormal pressure in the eye. The nerve damage involves loss of retinal ganglion cells in a characteristic pattern. Glaucoma affects one in 200 people aged 50 and younger, and one in 10 over the age of 80. If it is picked up in its early stages, it can be treated, slowing its development or, in some cases, even stopping it. But monitoring glaucoma is quite a hassle, and in most countries, glaucoma treatments are (let’s say) less than ideal. This is where this device steps in. The design is very elegant and effective – it features a tiny tube, capped at one end and opened on the other, filled with gas. As the fluid pressure pushes against the gas, a marked scale permits reading of the intraocular pressure. 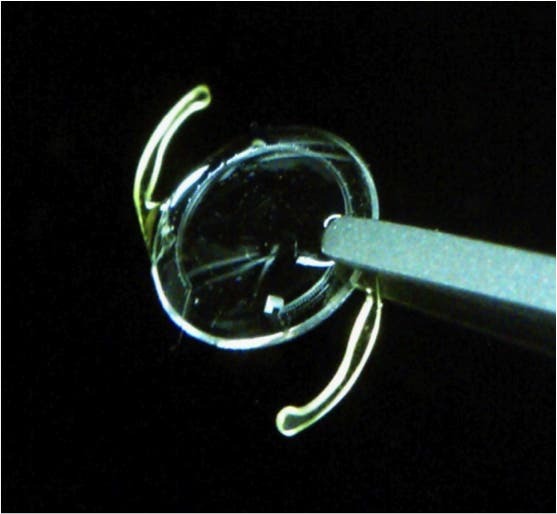 It has absolutely no effect whatsoever on the patient’s vision and it was made to fit inside a commonly used intraocular lens prosthetic, and implanted through simple surgery such as for cataracts which many glaucoma patients already receive. A smart phone (or laptop, or even Google Glass) enables the wearer to take snapshots, reporting the pressure. 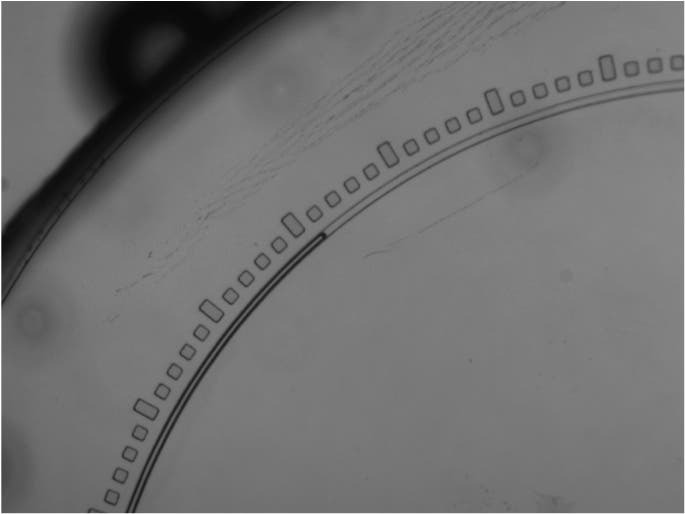 Close-up showing fluid-gas interface and tick-marks indicating intraocular pressure. Araci et al. Currently, patients have to go to the doctor to have their intraocular pressure tested every week, and cannot monitor spikes or sudden changes in pressure. Even so, measurements are sometimes not accurate, because pressure is affected by several external factors, such as posture, medication, and even tightly worn clothing; these wrong measurements can lead to misdiagnosis, and consequently, mistreatment. Before the implant can be tested in humans however, they still have to work on the durability of the materials, ensuring that it won’t degrade in the human eye. However, due to the simple design, this is not really expected to be a problem – there’s a myriad of materials which can be successfully applied.